Rice Bran Oil is truly "The World's Healthiest" edible oil, containing vitamins, antioxidants, nutrients and Trans fat free. It's not just delicate and flavorful; it can help lower cholesterol, fight diseases, enhance the immune system, and fight free radicals and more. Rice Bran Oil is extremely light, versatile and delicious. Use it to fry, sauté, in salad dressings, baking, dipping oils and where ever you use cooking oil. Once you use it you will be amazed cooking light and healthy is also the best tasting. Rice bran oil has a very high smoke (burn) point, making it perfect for deep frying, pan or stir frying and is a premium choice for the replacement of hydrogenated oil containing trans fat now being used in deep fryers. The most balanced and versatile oil on the market and closest to the AHA recommendations. These benefits have been known to the Japanese for long who call it the "Heart Oil".The American Heart Association (AHA) recommends the average intake of fat should be 30% of your total caloric intake. This fat intake should consist of balanced fat, which provides nutrients that are essential to sustain life. A Balanced fat intake should contain approximately 30% saturated fat, 33% poly-unsaturated fat, (containing Essential Fatty Acids) and 37% mono-unsaturated fat. It is rich in Vitamin E, hence provides protection from cancer causing radicals. The oryzanol and tocopherols present provide antioxidants. It can also strengthen the immunity. 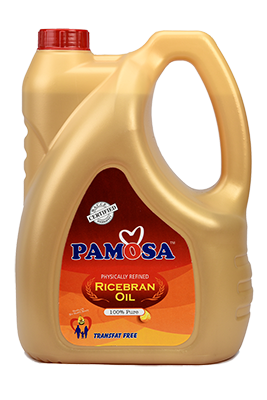 PAMOSA Rice Bran Health Oil contains the right amount of oryzanol (antioxidant) to provide cholesterol lowering properties. It reduces cholesterol formation and absorption thus reducing blood cholesterol, also reducing blood clotting by retarding platelets aggregation (thus lowering possibility of heart attack) and increases cholesterol excretion thus reducing total cholesterol effectively. When you eat a low carbohydrate diet cooked in PAMOSA rice Bran Health Oil, it also helps reduce triglycerides (a kind of blood fat), reduces the bad cholesterol (LDL) and improves the good cholesterol to bad cholesterol ratio (HDL/LDL) which is very important for heart health. Rice Bran Oil has a balanced fatty acid profile close to the World Health Organization (WHO), American heart association’s (AHA), the National institute of Nutrition (NIN) and the Indian Council of medical research (ICMR) recommendation. Rice Bran Oil has more antioxidants (like oryzanol, tocotrienol, tocopherol, squalene) as compared to other cooking oils. Better Skin :- Squalene softens the skin as it is a natural moisturizer . This effectively helps delay wrinkle formation and protects the skin from sun damage and maintains a healthy skin tone. Good for heart:Studies show that consuming rice bran oil has multiple effects and benefits that contribute in preventing and reducing the risk of heart diseases. It is a rich natural source of antioxidant "Oryzanol", a potent chemical compound and tocotrienol, a type of vitamin E that are known to lower cholesterol levels by reducing the levels of fat molecules triglycerides and bad cholesterol (LDL), and increasing the proportion of good cholesterol (HDL) in the blood. MUFA (Mono-unsaturated Fatty Acid) and PUFA (Polyunsaturated fatty acids) on the other hand keep blood vessels improving blood circulation. These benefits have been known to the Japanese for long who call it the "Heart Oil". Enhances the immune system :- Due to its high antioxidant content, it fights the free radicals that harm the immune system thereby protecting the body from disease. Besides benefiting the lipid profile, oryzanol also has anti dandruff and anti ageing properties. Helps prevent cancer :- Rice Bran Oil is rich in tocopherol and tocotrienols (vitamin E) which are powerful antioxidants. These are anti-mutagenic elements that curb the cancer causing free radicals thereby reducing cancer risk. Until recent times the health aspects of Rice bran oil have not been adequately highlighted. It is important for people to know that rice bran oil has not only cholesterol lowering properties but also has anti viral, anti itching and anti cancer effects. Nervous system and endocrine health :- The antioxidants found in Rice Bran Oil also benefits the nervous system. Vitamin E helps improve neurological functioning and balances the endocrine hormones. Good for hormonal health:Rice bran oil is known to contain compounds that regulate hormone secretion. It contains healthy amounts of Ferulic acid that has good effects on the concentration of endocrine hormones. Oryzanol found only in Rice Bran can also reduce hot flashes symptoms in menopausal women. Good for cooking:Rice bran oil is light and has a high smoke point which makes it ideal for cooking and frying. Food fried in rice bran oil absorbs less oil making it preferable for weight watchers. Because of its lightness and delicate and neutral taste rice bran oil is also great for dressing salads.With its many nutritional benefits it's no surprise that rice bran oil is steadily becoming the preferred oil to in healthy kitchens around the world. Now that you know its secrets, go ahead and give it a try. The best thing about Rice Bran Oil is that it retains antioxidant stability even at high temperatures. It has a high smoking point of 254°C. The usual frying temperatures are between 180°C- 190°C. Rice Bran Oil remains stable upto more than 250°C. So it has a high heat stability which is important when you are looking for a healthy cooking oil. High temperatures are known to produce mutagenic elements in edible oils as well as in the food that you cook in it. But this is not the case with Rice Bran Oil. It does not breakdown into toxic compound under high heat. Rice Bran Oil is less viscous so it does not stick to the food – which means that the food absorbs less oil which in turn reduces the oil content and the caloric value of the food making it healthier. It is a known fact that food cooked at high temperatures absorbs less oil. Since PAMOSA Rice Bran Health Oil is heat stable, one can cook at high temperatures (if needed) without having to worry about decomposition of the oil. This allows less oil to be absorbed by the food. Thus making it lesser in calories and therefore beneficial for your waist line and health in general. It has a flavor ideal for Indian cooking. So you can include this oil in your day to day cooking. It is viscous in nature and hence will be absorbed lesser by the foods and the food cooked in it will not be dripping in oil or soggy. It can be used for baking as it gives good texture. Great for salad dressing too. It has good shelf life ,it is as an olive oil for health but not expensive as olive oil.